Ellie has always disliked the Great White Shark – as the local big estate agent is called – and is distressed when her daughter Diana announces that she is carrying his child and about to become his fourth wife. Ellie is drawn into the family circle when one of the Hooper children dies in an incident in their private gym and another succumbs to a peanut allergy. The police would like to write off these deaths as accident and misadventure, but Ellie believes some one is targeting members of the Hooper family. Surely Diana wouldn’t… or would she? The surviving members of the Hooper family appear to be self-centred and unsympathetic but, as their numbers diminish, Ellie begins to understand the reasons behind the way they act. 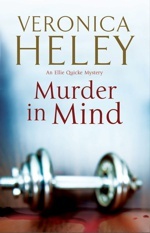 The thirteenth Ellie Quick Mystery. Ellie’s 12th is right on the money, with the heroine giving as good as she gets in her tangles with the boneheaded local constabulary. Often available in hardback, paperback, large print, audio CD and audio download.